Swim endlessly in place, in most any type of pool or swim-spa. Scroll down to browse through information Aquatic Training Systems, that enable you swim endlessly in place, in any kind of pool or swim spa. This the same professional-grade equipment that the swim pros use. Simple to install and use. The Website Store Directory contains an alphabetized listing of all products for sale. We don't just sell products. We help you make a better-informed choice, by providing all the information, you might require. Need ordering help? Scroll down the page, for the Order Desk Telephone Help Number. All items ordered will end up in the same shopping cart, no matter which page of this website, the items are located. All Major Credit Cards and PayPal are accepted. Order one today. Belt it on. Wade into the pool. Swim endlessly. • Endlessly, swim in place and get a better workout. • This is not a toy!!! This is a professional quality product. • It is engineered to provide performance and durability. • Models to suit all types of pools and situations. • Being tethered, allows you to swim without turns or interruptions. • Use it in a swim spa for a variable workout and better results. • Swim a mile - or more - without having to turn around. • Used to help train the U.S. Olympic Swimming Team!!! Buoyancy The diagram, on the left, indicates, there are 4 forces working on your body when swimming. Your body's natural buoyancy or tendency to float. Your body has a similar density to water, so it can float given certain efforts and conditions. Your weight pulls you deeper into the water and acts as the anchor force. While swimming, the hands and feet generate thrust, which propels you forward. The turbulence created by your body traveling through the water is a form of drag that continuously slows you down. Producing Excess Drag The diagram, on the left, shows a typical swimmer who’s legs and feet are too deep in the water during swimming. This produces excess drag, slowing him or herself down and reducing their overall swimming performance and efficiency dramatically. These Aquatic Fitness Trainers can be used in inground, above ground pools or swim spas. Use more than one, to get everyone into aquatic training. Fitness experts, from exercise physiologists to rehab specialists, agree that swimming is the "perfect" exercise. These Aquatic Fitness Trainers will help you meet your fitness goals, whether, it's shedding those extra pounds, toning up or simply relieving everyday stress. Streamlined Swimmer The diagram, on the left, shows a swimmer who has been using an Aquatic Fitness Trainer and has trained himself to maintain the correct streamlined swimming posture. Is it any wonder that this is the product of choice, of so many swim professionals? You don't have to be a swim pro, to get the aquatic workout you want. And you don't have to spend a fortune. These Aquatic Fitness Trainers helps build strength and burn calories, giving you the same benefit as lap swimming, but in 1/2 the time! In just minutes a day, you can be on your way to having a dynamic cardiovascular workout, a fit body with firm toned muscles. Get the workout, you want. The harder you swim, the greater the resistance provided by the pole. Used by YMCA's, University of Ohio, Miami Dolphins, University of Tampa, University of Miami, San Francisco Hilton, Northwestern Orthopedics, Mecklenberg (Charlotte, NC) Aquatic Club, University of Florida, California State University at Bakersfield, Hall of Fame Swim Team of Ft. Lauderdale, Florida and many, many more. Used by the U.S. Olympic Swimming Team and recommended by Olympic Swimming Coaches. Works in most any pool or swim-spa. Swim Endlessly in place . . . just like the pros do!!! Don't spend a fortune, when you can do it for a bit more than $200.00. This Aquatic Fitness Trainer can be used in inground pools or swim spas, by attaching to the deck. Made for use by professionals and home fitness buffs. Use one or more and get the family involved. 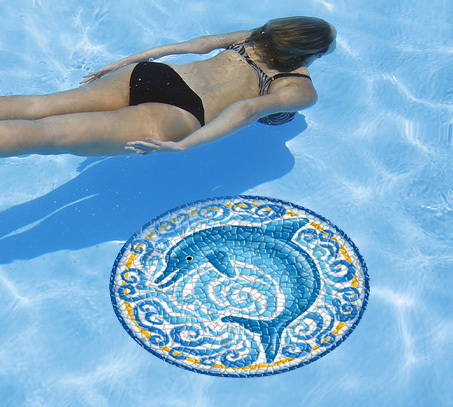 The in-deck base is installed directly into the concrete surrounding your pool or swim spa. Includes everything. ● Pole length is 7-feet (2.13 meters). Available with a 1-part or 2-part pole. ● Harness belt accommodates waist sizes 20'-64" (50.6 cm x 162.6 cm). ● Professional-Grade. American-Made. Patented design. ● Shipping dimensions: 84" x 4" x 4"
Available with either a 1-part pole or a 2-part pole. This Aquatic Fitness Trainer can be used in inground pools or swim spas, by clamping to a stair, rail or ladder. A product made to professional standards and not a simple toy. Simple to install or remove and easy to move to a different location. Includes everything, including a convenient travel bag. ● Pole length is 7-feet (2.13 meters). Available only with a 2-part pole. ● Convenient travel bag hold everything. ● Most economical shipping option, for out of North America destinations. ● Shipping dimensions: 42" x 4" x 4"
Scroll down the page to read shipping and returns policy. The Aquatic Fitness Trainer can be used in above ground pools or swim spas, by utilizing the adaptor base, which is included. Swim without having to turn around, even in a small pool. A professional quality product that will stand up to heavy use. Includes everything. This Aquatic Fitness Trainer can be used in above ground pools or swim spas, by utilizing the adaptor base, which is included. Swim without having to turn around, even in a small pool. A professional quality, American made, product that will stand up to heavy use. ● Shipping dimensions: 84" x 4" x 4" and 24" x 18" x 12"
Travel Model assembled & clamped to a ladder rail. A Complete Portable "Two-Part" swim system, allows the user to travel anywhere and set up for swim training, group swim classes, workouts or aquatic therapy sessions. Pole is in two parts, for travel convenience. Complete set-up in only 5 minutes, by clamping to a ladder or rail. Complete kit with travel case. ● Pole length is 7-feet (2.13 meters), when the 2 parts are connected. ** The size of the 2 cartons makes shipping, outside of the Continental U.S. very expensive, costing far more than the product. The Travel Model can ship Internationally, at reasonable costs. & PRO Test Strips Kit. For all the testing a salt pool or spa needs.